Are you wondering, What is Baby Led Weaning? Interested in doing baby led weaning or just wondering what the heck it is? I’m so glad you’re here! 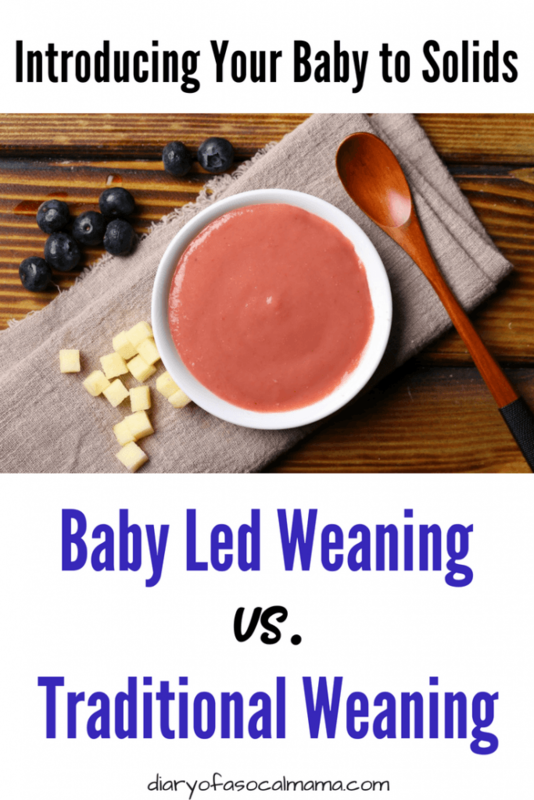 After reading this I hope you’ll check out my whole series of posts about baby led weaning, if not at least you’ll know what the others moms are talking about now. Baby Led Weaning in itself is a bit of a misnomer. It was nothing to do with weaning in the way we normally think of it. It’s not a technique to wean a baby off breastfeeding or a bottle. Baby Led Weaning is simply one method of introducing solids to your child and this method has been coined baby led weaning. Let’s find out what it is! 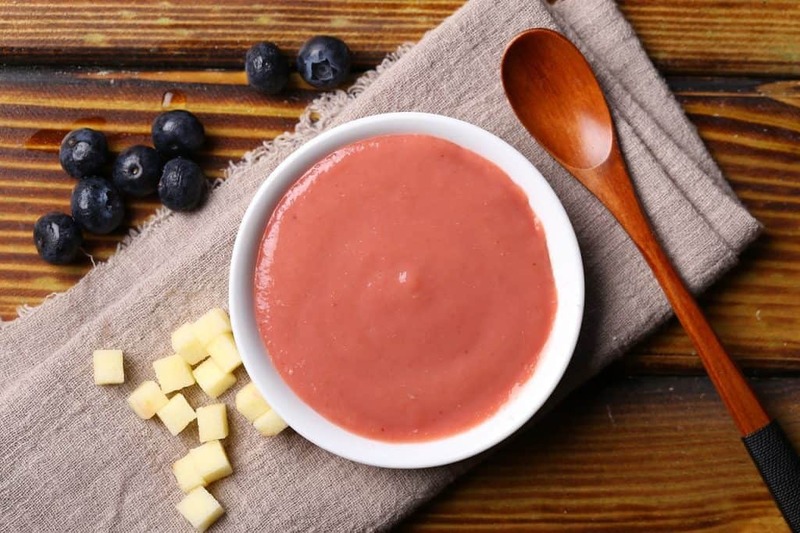 Traditional Weaning – What’s now referred to as traditional weaning is what many of our parents did with us, somewhere between 4-6 months you begin feeding purees, whether store-bought or homemade. Eventually, you move to regular table food, but later down the road. In the photo above the bowl is a puree, what you might spoon feed a child if you are doing traditional weaning. The two food items have been blended together and mixed until smooth, so the child will get a combined taste and the food will all be one texture. Baby Led Weaning – When doing baby led weaning you skip the purees and jarred baby food. Instead baby eats what you eat, within reason. You teach your baby from the start how to take bites and chew food. It also gives them more autonomy as your baby will be feeding themselves. In the photo above the blueberries and pear would be given as separate items so your baby could enjoy the flavor and texture of each individually. (Warning: This picture is just an example, the solids pictured are not prepared appropriately for a young child). The answer to this one is, whichever you are more comfortable with. Eventually, children who have solids introduced either way will eat food just like you and I. Both will get messy, both will throw food on the floor, both will be picky toddlers who refuse to eat anything at times. Baby Led Weaning is a newer approach so research is certainly still being done. But as of now reports suggest that there are several potential benefits to doing baby led weaning. Children may be less likely to overeat as they are in control of how much they eat from a young age.When you feed a baby purees you are in control of how much they are fed. You also may continue to feed and encourage your child to eat past the point of fullness. Since a child is feeding his/her self in doing baby led weaning they will stop eating when they are full. You may be surprised how much these little ones can pack away during a growth spurt! Children may be less picky as they’ve been exposed to different textures. When you feed purees everything is one texture and the flavor of vegetables are often masked by mixing them with fruits. This may lead to a child who is later unwilling to eat certain textures of food, or foods with stronger flavors as they are not accustomed to it. These are the bare basics about what baby led weaning is. If you are ready to learn more about baby led weaning or even start it with your own child I have an entire section of my blog I’m filling with information all about baby led weaning. Check out my Nervous Mama’s guide to baby led weaning where I talk about the how to as well as the do’s and don’t of doing this method. Check it out so you know how to start baby led weaning with your own child. this is a really good breakdown of the differences between the two!